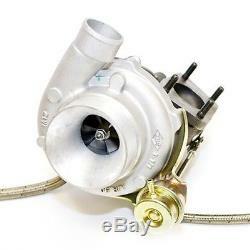 Garrett GT3582R Bolt-on Stock Location Turbocharger Kit. MZR 2.3 DISI Turbo. This ATP Turbocharger Kit features the Garrett GT Ball Bearing GT3582R, quite possibly the fastest spooling and most responsive 550+HP capable turbo on the planet now available in a drop-in package for the Mazdaspeed 3. The Garrett GT3582R turbo with ATP proprietary exhaust housing and internal wastegate all ready to bolt up to Mazdaspeed3 exhaust manifold and downpipe. The kit includes all necessary coolant and oil connections to connect the turbo to factory lines. This turbo is efficient up to 35 psi on the MS3 2.3L turbo engine with stock inlet and downpipe and can produce 550 crank HP as configured with supporting mods and proper tuning. This setup is highly recommended for a very broad powerband with a lot of "area under the curve". Each GT drop-in turbo package consists of a Garrett factory assembled and high speed balanced dual ball bearing CHRA which is then assembled into a set of CNC machine ported housings that have been optimized in every aspect for maximum flow and efficiency. For the best performance add a 3-inch turbo inlet pipe and 3-inch downpipe necessary to maximize the output of this turbo. Dual Ball-Bearing Turbocharger for the best spool time - You can still hear the wheel spinning after you shut off the motor. Capable of 550 horsepower or more. Direct bolt-on installation to factory turbocharger location.